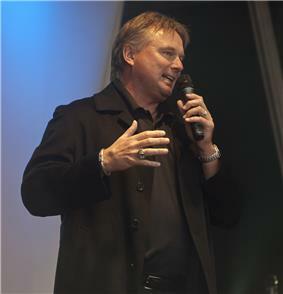 Morten Andersen (born August 19, 1960), nicknamed "The Great Dane", is a former National Football League kicker and All American at Michigan State University. He is the all-time leader in games played in the NFL at 382, in addition he also holds the distinction of being the all-time leading scorer in NFL history, as well as being the all-time leading scorer for two different rival teams; the New Orleans Saints, with whom he spent 13 seasons, and the Atlanta Falcons, with whom he spent a combined eight seasons. Andersen was born in Copenhagen and raised in the west Jutland town of Struer, Denmark. As a student, he was a gymnast and a long jumper, and just missed becoming a member of the Danish junior national soccer team. He visited the United States in 1977 as a Youth For Understanding exchange student. He first kicked an American football on a whim at Ben Davis High School in Indianapolis. He was so impressive in his one season of high school football that he was given a scholarship to Michigan State University. Andersen, with his left leg as his dominant kicking leg, starred at Michigan State, setting several records, including a Big Ten Conference record 63-yard field goal against Ohio State University. He was named an All American in 1981. His success landed him the kicking job with the New Orleans Saints. On September 24, 2011 he was inducted into the Michigan State University Athletics Hall of Fame. Andersen's NFL career got off to a rocky start. On his first NFL kickoff to start the strike-shortened 1982 season, Andersen twisted his ankle and missed eight weeks of the season. Despite the early setback, he soon emerged as one of the strongest and most reliable placekickers in the NFL. In his years with the Saints, he was named to six Pro Bowls, kicked 302 field goals, and scored 1318 points. In 1991, against Chicago, Andersen kicked a 60-yard field goal, tying him with Steve Cox for the second-longest field goal in league history at the time, behind the 63-yard record-holder kicked by Tom Dempsey. (Andersen's kick has since been matched by Rob Bironas, Dan Carpenter and Greg Zuerlein, and surpassed by Sebastian Janikowski (twice), Jason Elam, Justin Tucker, Jay Feely, Matt Bryant, David Akers and Matt Prater.) Andersen's proficiency with field goal kicking earned him the nickname "Mr. Automatic." Following the 1994 season, he was released by the Saints for salary cap purposes and because his accuracy had started to decline. In January 2006, Andersen was inducted as the first member of the Danish American Football Federation Hall of Fame. Later that year, Andersen returned to the NFL, re-signing with the Atlanta Falcons; Andersen was brought in to help Michael Koenen, who was at the time performing double duty as punter and kicker (an extremely rare occurrence in the NFL) missing several field goals in that capacity, and Koenen reverted to strictly punting after Andersen's signing. His first game back was against his former team, the Saints, on Monday Night Football. The game was the first game in the Louisiana Superdome since Hurricane Katrina prevented its use for the entire 2005 regular season. Andersen scored the only Falcon points with a 26-yard field goal in the first quarter. In his second game back, Andersen made 5 of 5 field goals (matching his career best for the ninth time), as well as both extra point attempts. He was named NFC special teams player of the week, becoming the oldest player to earn the honor since the award was first introduced in 1984. He is also the team record holder for both the New Orleans Saints and the Atlanta Falcons for overall points scored. ^ a b "Andersen, 48, hangs up cleats as all-time top scorer". espn.com. Retrieved 2008-12-08. ^ "Morten Andersen #7". nflplayers.com. Retrieved 2006-12-09. ^ Zimmerman, Paul (October 16, 2003). "Just For Kicks". Sports Illustrated. Retrieved 2006-12-17. ^ AP (December 23, 1996). "Andersen's Miss Puts Jaguars in Postseason". Chicago Sun Times. Retrieved 2007-11-05. ^ "Sportsticker NFL Recap (Arizona-Atlanta)". CoverWire.com. Retrieved 2007-11-07. ^ Mike Triplett, "Saints add K Morten Andersen to exclusive Ring of Honor", ESPN.com, August 3, 2015. ^ "NFL Career Games Leaders". pro-football-reference.com. Retrieved 26 September 2010. ^ "NFL Career Field Goal Attempts Leaders". pro-football-reference.com. Retrieved 26 September 2010. ^ "NFL Career Total Field Goals Made Leaders". pro-football-reference.com. Retrieved 26 September 2010. ^ "NFL Career Points Scored Leaders". pro-football-reference.com. Retrieved 26 September 2010. ^ "For single seasons, from 1920 to 2010, requiring Points Scored >= 75, sorted by most seasons matching criteria.". pro-football-reference.com. Retrieved 26 September 2010. ^ "For single seasons, from 1920 to 2010, requiring Points Scored >= 90, sorted by most seasons matching criteria.". pro-football-reference.com. Retrieved 26 September 2010. ^ "For single seasons, from 1920 to 2010, requiring Points Scored >= 98, sorted by most seasons matching criteria.". pro-football-reference.com. Retrieved 26 September 2010. ^ "In multiple seasons, from 1960 to 2010, in the regular season, requiring Total Field Goals Made >= 1, sorted by most games matching criteria.". Retrieved 26 September 2010. ^ "In multiple seasons, from 1960 to 2010, in the regular season, requiring Total Field Goals Made >= 2, sorted by most games matching criteria.". Retrieved 26 September 2010. ^ "In a single game, from 1960 to 2010, in the regular season, requiring Points Scored >= 14, sorted by descending Age.". Retrieved 26 September 2010. ^ "In a single game, from 1960 to 2010, in the regular season, requiring Total Field Goals Made >= 4, sorted by descending Age.". Retrieved 26 September 2010. ^ "In a single game, from 1960 to 2010, in the regular season, requiring Total Field Goals Made >= 5, sorted by descending Age.". Retrieved 26 September 2010. ^ "For single seasons, from 1920 to 2010, requiring Points Scored >= 100, sorted by most seasons matching criteria". pro-football-reference.com. Retrieved 26 September 2010. Andersen had stated that his goal was to be the first NFL player to play until he turns 50 in 2010. However he retired December 8, 2008 – just two days after he would have become the oldest player ever to appear in an NFL game, if he had gotten a contract. The record held by 1975 AFC Championship) at the age of 7009152418240000000♠48 years, 109 days. On November 6, 2009, Andersen was inducted into the New Orleans Saints Hall of Fame. In August 2015 he was announced as the fourth member of the team's Ring of Honor.